This Mushroom Green and Blue Beaker Grace Glass bong is a special piece of glass art that will offer you a momentous experience! 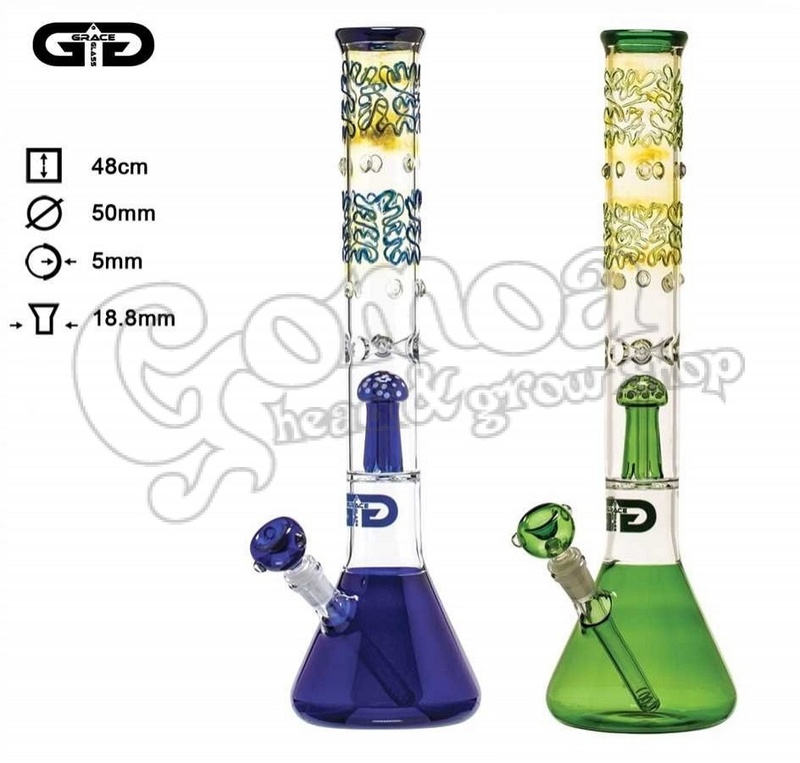 It comes with green or blue accents upon the robust heat proof borosilicate glass, formed in the shape of a beaker base tube of 48cm height, 50mm diameter and 5mm wall thickness. You can place your favourite herbs upon the 3 point green bowl, which connects to a detachable chillum through a sure ground of 18.8mm diameter. The chillum is used as a diffuser, for spreading your smoke into the water chamber, so that it gets filtered by the water. It includes also a mushroom percolator, for bubbling up your smoke, and some ice noches that can hold a few cubes, for cooling your smoke. With the Grace Glass logo featuring under the percolator, the bong ends up in a mouthpiece ring through some delicately embossed designs.